Wow! Baby Hazel’s vacation is full of surprises. Today she is going to her Granny’s house for the very first time. Hazel is very excited and wants to enjoy each and every moment of her trip. Go with darling Hazel to explore her Granny’s house and nearby areas. Attend to all the needs of the little lass and her grandparents. While at Granny’s place Hazel will make new friends and learn interesting things. Play through to the end to see the beautiful present Granny makes for her! Have fun! In the first level, Baby Hazel and Granny ride the train to Granny’s house. Keep Hazel and Granny entertained and fed while on the train. Help Hazel mind her manners and take pictures to remember her trip. What a fun ride! After their long trip, Hazel and Granny enjoy a family meal. Grandpa has some juice with them and keeps them company. Help Hazel mind her manners, answer her phone to talk to her Mom, and get over her surprise when Granny’s little pet Wiley suddenly pops out. Hazel and Granny explore some antiques and Granny gives Hazel some nice things to take home. Granny takes Hazel to the market to shop for some vegetables for dinner. Granny helps Hazel buy her friend Mia a present, and they meet a new friend while having a snack. Help Hazel save Granny from a slippery situation and teach her new friend about littering. Granny promises to make Hazel something special when they get home. Errands can be fun! When Granny and Hazel get back from their shopping, Hazel helps Grandpa in the garden, where she meets a new friend, learns about flowers, and enjoys a little break with her grandparents while Granny makes her a beautiful present. What a fun trip to Granny’s house it’s been! 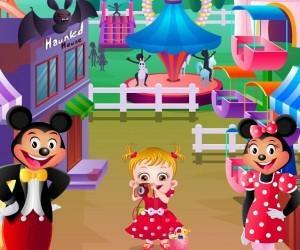 Baby Hazel’s Vacation helps players practice reading skills, hand-eye coordination in using the mouse, learn about social responsibilities and safety, and practice good manners. 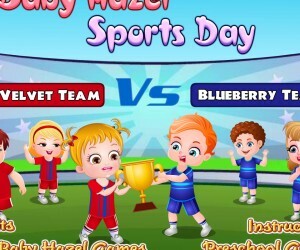 With only four levels, the attention span required to finish the game is suitable for even the youngest players, although the reading skill required to follow the game play may dictate some assistance. 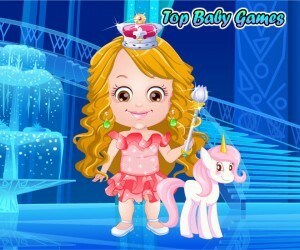 In general, the game is light-hearted and quick, eminently suitable for an adult and toddler to experiment with using the computer for the first time. Baby hazel’s vacation is full of surprise. She is going to her granny’s house for the very first time and she is REALLY excited and ready to enjoy every moment there. Let’s explore her granny’s house and the surrounding areas. Pay attention as you have to fulfill her needs and also her grandparent’s. Also, while at granny’s place, Hazel will meet a new friend. Play this game and find out who. Enjoy!